Last year's CamelOne event went so well that FuseSource is doing another one this year. 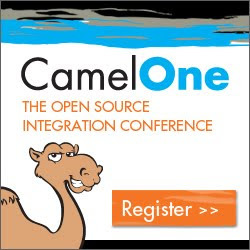 Awesome news because CamelOne 2011 was a blast! :) IMO smaller, more focused conferences like CamelOne are more beneficial than the big "all-inclusive" conferences. It is still very early in the planning so speaking slots are still available. Registration details are on the CamelOne 2012 site. Cheers to another win for the Apache Camel community!